Nordstrom is accepting pre-orders for it's anniversary sale online. Don’t get caught sleeping, some things sellout rather quickly. Last- year I called around the country attempting to locate a Novel Twist brush set. Here’s what I’m ordering, what about you? Laura Mercier Twilight Colour Collection captures fall's dusky presence with hues of heather, pink and slate. Twilight Mini Eye Mosaic, with the help of a Double-Ended Smudge & Angled Eye Colour Brush, creates endless looks. A mini Purple Sapphire Kohl Eye Pencil and full-size Black Mascara enhance the dusky, smoky effect. Lips are in alluring shades of pinky mauve with Cinnamon Lip Glacé. A French Vanilla Hand Creme plays on the trend this fall to complete your look. All items conveniently packaged in a brown, faux patent leather bag with contrast stitching. 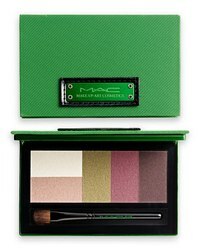 A set of five limited-edition warm-toned Eye Shadows packaged in a green anodized metal compact detailed with matching nylon fabric and a metal M·A·C nameplate. Comes with its own glossy black 213 SE Eye Shadow Brush.